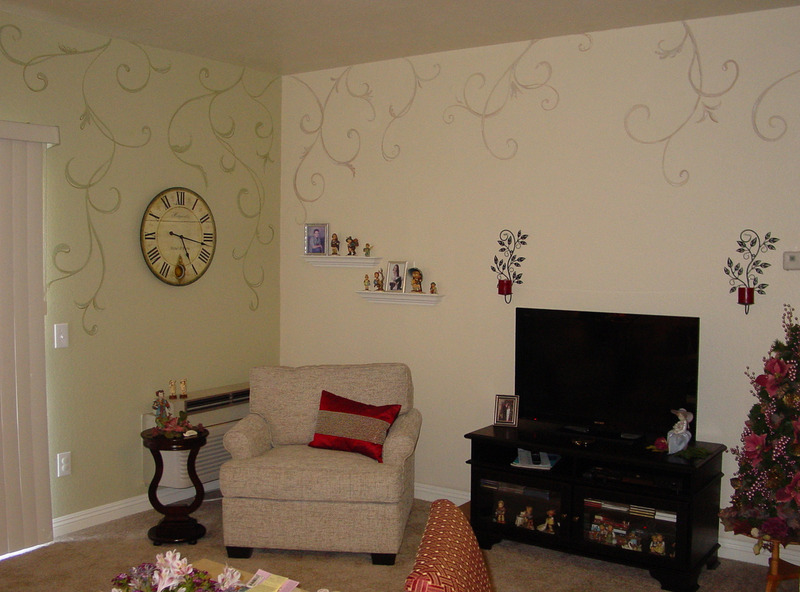 My mother-in-law is living in a lovely Independent Living apartment and I made even nicer by softening the decor with my swirly mural. We worked all day to get the swirls just the way she likes them and we’re both pretty happy with the results. I especially love the green wall with the clock that was a gift from a special friend. Next PostScience Lab DNA Mural, school mural. Amazing how something so simple can make such an impact in a room. Love it! Thanks K. I’m so happy that you look at this. It’s time for H to update hers, don’t you think? I adore the swirly curly things and yours are gorgeous. Do you do this free hand or do you use a stencil ?? Thank you. I appreciate the kind words. I free hand although I often prep drawings on Photoshop using images of the room. When you draw directly on the wall, use chalk in a color close to what you’re painting. I’ve found pencil too difficult to remove. On swirl walls, I like to use a color that’s in the same family as what’s already on the wall. Good luck with yours. I’d love to see what you do.